"All of us can remember times in our lives when we felt a pull to be better than we were, to rise higher. The feeling may have come at about the same time we had the thought 'There must be something better in life than this.' Sadly, there are also times when we felt like giving up. And then the thought was something like 'Maybe this feeling of being miserable is what life is really like. Maybe I need to learn to live with it. It looks as if that's how everyone else feels. Those movies about feeling good and those people who look happy have bought into an illusion.' I remember there was even a T-shirt made with a slogan on the front saying, 'Life is hard and then it's over.' And the look on the man's face wearing it made it seem that he was living proof. "But everyone that I have come to know well, even the most discouraged and the most miserable, will tell you that sometime in their lives, maybe just once that they can remember, they felt that upward pull, that thought that there just had to be something better and higher. "The feeling that you are meant to be better, perhaps in a way you haven't yet discovered, comes from our Heavenly Father. The opposing thought, that the upward pull is an illusion, comes from the adversary, who wants us all to be miserable, as he is. "Heavenly Father does more than allow you to feel that upward pull. 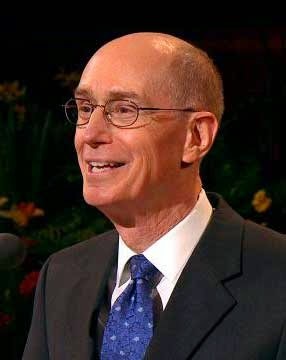 He has provided a way to rise higher, almost beyond our limits of imagination, not by our own powers alone, which would not be nearly enough, but through the power of the atonement of his Son, Jesus Christ." 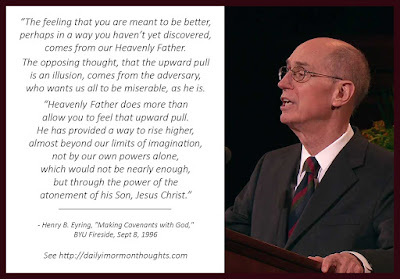 This is such a hopeful, optimistic, encouraging expression—there is an "upward pull" that invites us to overcome the things of the world that hold us back, drag us down. We can be better; we can rise above our challenges or discouragements. We may be miserable in current circumstances, but we don't have to remain miserable. We must remember that our Heavenly Father offers hope, now and always; but it's the adversary who seeks our misery and tries to convince us "that the upward pull is an illusion." And the glorious eternal truth is that Heavenly Father doesn't just let us feel the upward pull; He provided the means of implementing it, of rising higher through the challenges of life. How grateful we must always be for the wondrous atonement of Jesus Christ, that provides the means of overcoming all misery, disappointment, and frustration, so that we truly can rise above this world even while we remain a part of it.